Radio Edit 2:50 Get Low La Musique Fait La Force / N.E.W.S. 3:33 Get Low La Musique Fait La Force / N.E.W.S. 2:48 De Maxx - Long Player 32 [UK Edition] La Musique Fait La Force / N.E.W.S. 2:02 Gunther D - Klappers van het jaar La Musique Fait La Force / N.E.W.S. 2:50 Gunther D - Klappers van het jaar La Musique Fait La Force / N.E.W.S. I like this! Good effort from both artists. Has made a much better first impression than "Turn Down For What" for me. Quite a cool track, I like it about the same as "Turn Down For What". Le drop est foutrement orgasmique. 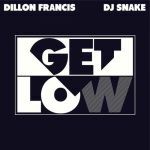 ▒ Eigenlijk helemaal géén verkeerde samenwerking uit begin februari 2014 tussen de Amerikaanse muziek producer: "Dillon Hart Francis", en de Franse DJ en producer: "William Grigahcine", alias: "DJ Snake" !!! Voldoende ☺!!! Turn Down For What was at least entertaining but this is just average. Vom Songaufbau her ähnelt das "Turn Down For What" doch ziemlich, finds auch nur in Maßen innovativ. Aber der Sound ist insgesamt doch weitaus braver und weniger aufdringlich, in diesem Fall für mich also angenehmer zu konsumieren. I often see a title/artist combination and make an expectation of the song based on that. My expectation is sometimes wrong. This was not one of those times. Die Arabertröte ist noch das Beste an diesem Lied.